Cynthia Sung, BS, Wan Jiao, MD, PhD, Sun-young Park, MS, Michael Cooper, BS, Eun-son Jung, MS, Young-kwon Hong, PhD, Alex Wong, MD. Keck School of Medicine of USC, Los Angeles, CA, USA. PURPOSE: Secondary lymphedema is a debilitating disease characterized by chronic soft tissue swelling. While there is still no cure for lymphedema, we have shown that 9-cis-Retinoic acid (9-cisRA) promotes lymphangiogenesis and reduces postsurgical lymphedema in vivo. Despite the resulting efficacy, little is known about the signaling pathway of 9-cisRA in this context. 9-cisRA is thought to induce its target gene responses by binding to and activating nuclear retinoid X receptors (RXRs). The aim of this study was to determine whether RXR signaling is necessary for 9-cis-RA efficacy using lymphatic endothelial cell specific conditional deletion mutant mice. METHODS: Tail model of lymphedema was performed on transgenic Prox1-CreERT2 RXRαfl/flmice and an age-matched control group. Superficial lymphatic vessels were severed by a 5-mm circumferential excision 2-cm distal from the tail base. The animals were treated with 9-cisRA once daily for 40 days. The distal part of the tail was imaged weekly postoperatively and tail volumes were calculated using the truncated cone formula. Tail samples 1-cm distal to the wound edge were collected and histologically analyzed to assess soft tissue thickness. RESULTS: Disruption of the superficial lymphatics resulted in initial surgical edema in both the control and RXRαfl/flgroups. 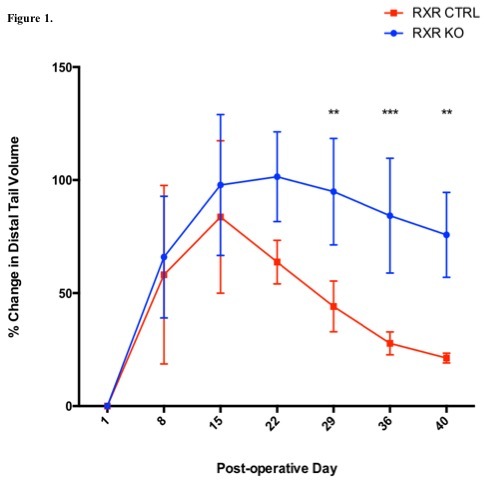 The RXRαfl/flgroup showed a significantly less decrease in swelling at post-op days 29, 36, and 40 (**p≤0.01) (Figure 1). 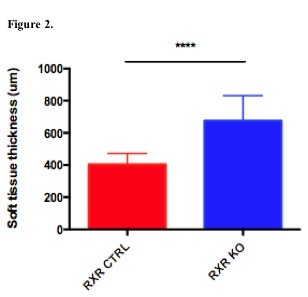 RXRαfl/flmice showed significantly thicker soft tissue on post-op day 45 compared to the control (****p≤0.0001) (Figure 2). CONCLUSION: Functional RXRαin lymphatic endothelial cells is necessary for 9-cisRA to reduce postsurgical lymphedema. These detailed mechanistic studies support further translation of 9-cisRA for safe clinical use in the prevention of lymphedema in humans.